Ah, Italy…It is one beautiful place where food is not only celebrated, but revered. 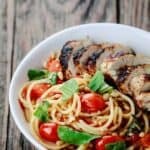 I found myself yearning for a little taste of Italy this evening, and decided to go for this simple chicken and spaghetti recipe with a tomato-basil wine sauce. And let me tell you, it did the trick! There are some moments in life when one (me) does not want to be seen by others. Lucky thing, I am behind my computer and you can’t witness me in such a moment of utter messiness. I am speaking of the outer edges of my mouth that are covered with remnants of my spaghetti dinner. I know a chicken spaghetti dinner sounds humble. And, it is. But this was just the right bite of comfort-by-carbs that I desperately needed. I couldn’t help but recall this short scene from the movie Eat, Pray, Love. Watch Elizabeth (Julia Roberts) as she zooms in on her spaghetti forgetting all else around her. There are not so many fancy words to describe today’s tomato-basil spaghetti with blackened chicken. But as casual and unpretentious a bowl of spaghetti can be, it is simply hard to resist. Rather than going with a meaty spaghetti sauce, I decided to braise grape tomatoes in olive oil and a little butter. Then to complete my sauce, I added some white wine and lime juice to provide a balanced citrus kick. As in most of my recipes, there is a shameless amount of fresh garlic, not to mention the green onions:-) Do not skimp on these ingredients, I beg you; they do make a big difference. Elizabeth Gilbert’s memoir Eat, Pray, Love takes her to Italy, India and Bali– experiencing the unique art, culture, spiritual practices and more. But her journey was so vividly marked by, and started with food… EAT. In an interview I recently watched, the author describes why she chose to go to those three countries. She shared that she went to Italy to find relief and beauty. 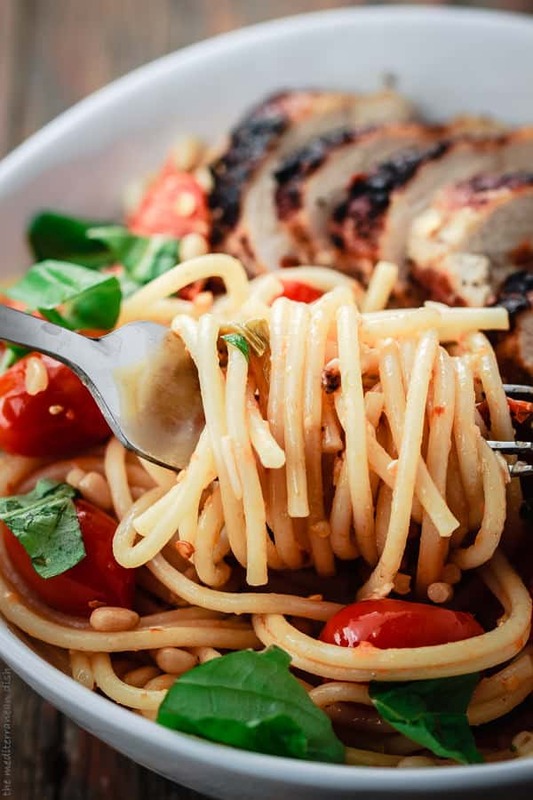 On that note–and before this sounds too much like a book/movie review–let’s journey to Italy and make this simple tomato-basil spaghetti recipe with blackened chicken. Pin this recipe and share it with your friends! Pat chicken breasts dry. Mix spices together and spice chicken breasts generously on both sides. Heat olive oil and butter in a large cast iron or oven-safe skillet. 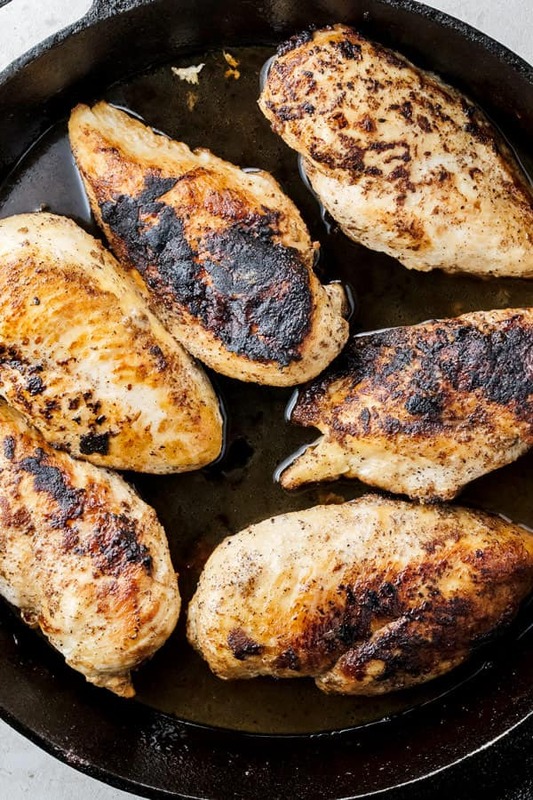 Brown chicken breasts deeply on both sides. Turn heat off. Add 1/4 cup water and lime juice. Transfer chicken to the 400 degrees F-heated oven. Bake for 25-30 minutes, turning once. When ready, remove from oven, cover and let sit for 5 minutes. While chicken is baking, cook the pasta according to the package. Mine cooked in about 9 minutes in boiling water with a dash of salt. When ready, drain in a large colander. Set aside briefly. In a large heavy cooking skillet, heat 1/2 cup olive oil and butter. Stir in crushed red pepper flakes. Add tomatoes, garlic and green onions. Cook for 5 minutes on medium-high. Now add white wine and lime juice. Let cook another 5 minutes to slightly reduce. Season with salt and pepper. 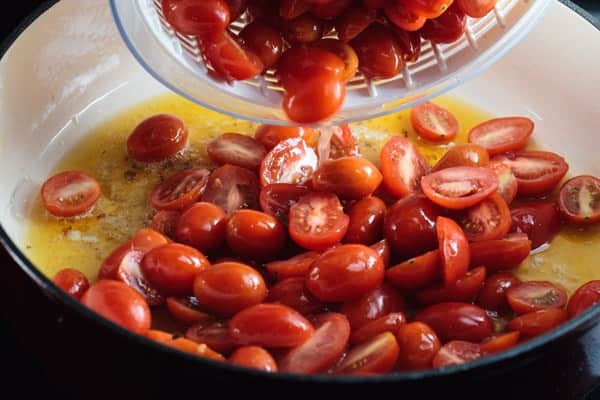 Reduce heat to medium, cover and let simmer for 7-10 minutes or until tomatoes turn a nice rusty orange. Uncover and stir the pasta in with the tomatoes. When the pasta heats through, finally toss in the basil leaves, Parmesigiano Reggiano and tossed pine nuts (if you choose). Transfer spaghetti to serving bowls and top with the blackened chicken breasts. Enjoy! *Disclaimer: As an Amazon affiliate, I receive a very small credit when you make a purchase through a link I provide. This is one small way to support this blog and my work. Please know, I only recommend quality products that I believe are priced competitively. But, please only purchase products of benefit to you. To browse Amazon for other products not mentioned here today, please follow this link. 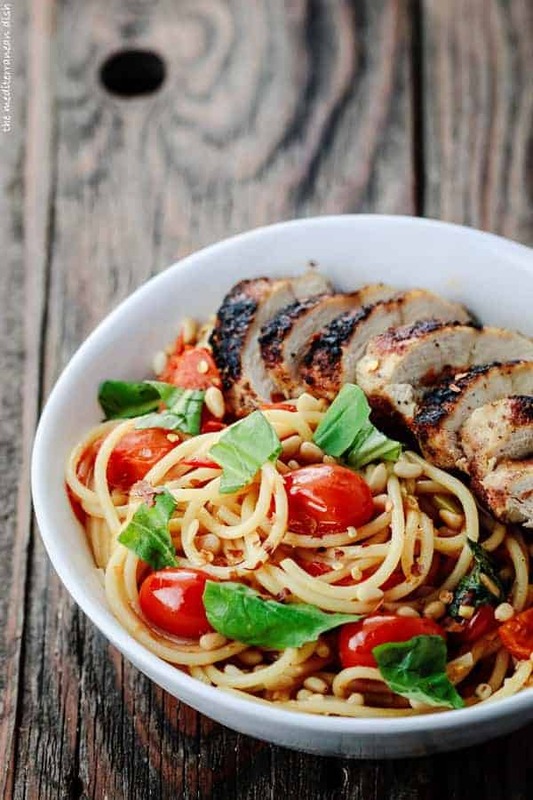 Try this simple chicken and spaghetti recipe with a tomato-basil wine sauce. It’s quick to whip up and will satisfy your craving for some yummy Italian food! Pat chicken breasts dry. Mix spices together and spice chicken breasts generously on both sides. Heat olive oil and butter in a large cast iron or oven-safe skillet. Brown chicken breasts deeply on both sides. Turn heat off. Add 1/4 cup water and lime juice. Transfer chicken to the 400 degrees F-heated oven. Bake for 25-30 minutes, turning once. When ready, remove from oven, cover and let sit for 5 minutes. While chicken is baking, cook the pasta according to package. Mine took about 9 minutes in boiling water with a dash of salt. When ready, drain in a large colander. Set aside briefly. In a large heavy cooking skillet, heat 1/2 cup olive oil and butter. Stir in crushed red pepper flakes. Add tomatoes, garlic and green onions. Cook for 5 minutes on medium-high. Now add white wine and lime juice. Let cook another 5 minutes to slightly reduce. Season with salt and pepper. 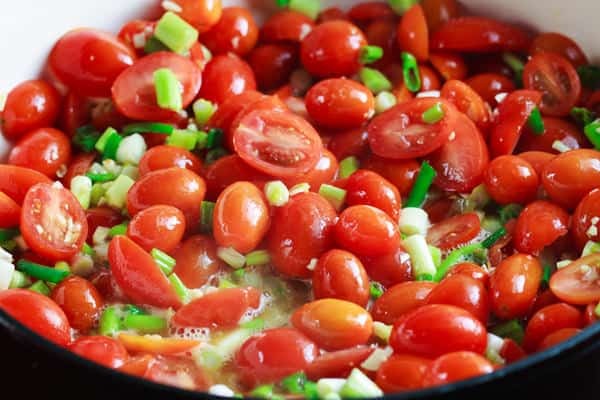 Reduce heat to medium, cover and let simmer for 7-10 minutes or until tomatoes turn a nice rusty orange. Uncover and stir the pasta in with the tomatoes. When the pasta heats through, finally toss in the basil leaves, Parmesigiano Reggiano and tossed pine nuts (if you choose). 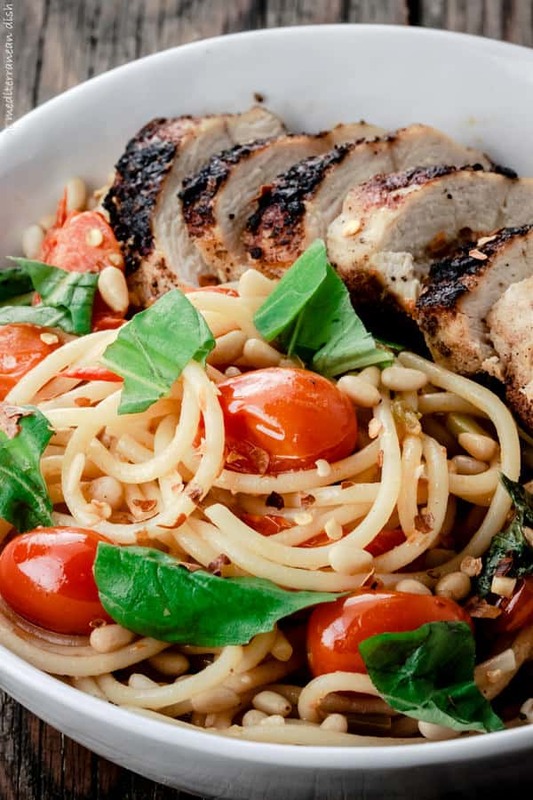 Transfer spaghetti to serving bowls and top with the blackened chicken breasts. Enjoy! Chrissie, thank you for sharing! Tuna would work great here too!! And so glad you can use your garden veggies! Hello, I’m very excited about your Mediterranean website. My PCP wants me to follow this way of eating now. My husband and I are both on it. I love recipes and am always searching for new ones. I see many recipes that call for dry white wine – can you please suggest one that works well for you? Hi Lee, welcome to The Mediterranean Dish! so glad you found our site. I typically use dry white wine that’s not too expensive, but one that you could still drink and enjoy. I use Chardonnay or Pino Grigio. Really enjoyed this recipe, very tasty. Only con was ended up with a lot of dishes to wash afterwards. Glad you enjoyed it, Jennie! Awesome may I use this recipes on my website. If yes, so please let me know. Katrina, thank you for stopping in! I am going to send you an e-mail regarding recipe use. Your website looks wonderful, but we have some restrictions on the use of The Mediterranean Dish recipes. This is gorgeous!!!! Love a delicious pasta dish!! This is my favourite way to serve pasta! Love the chicken with pasta and that homemade sauce sounds so good. No such thing as too much garlic 🙂 I love how I can make this for my husband, and make myself a vegetarian version! Agreed! never too much garlic 🙂 Thanks for stopping in, Kacey! That might be a humble dinner to you but to me it’s absolutely exquisite. It’s beautiful to look at, healthy to eat and I’m sure it tastes out of this world good. Gorgeous photos too! Thank you, Maureen! It was a very satisfying dinner on many levels. I am heading to my kitchen right now since I have all ingredients on hand. This looks simply delicious. Thank you for sharing. Wonderful, Susie! Thank you for stopping in. Enjoy your dinner! Oh, heaven! What a wonderful combination of flavors. 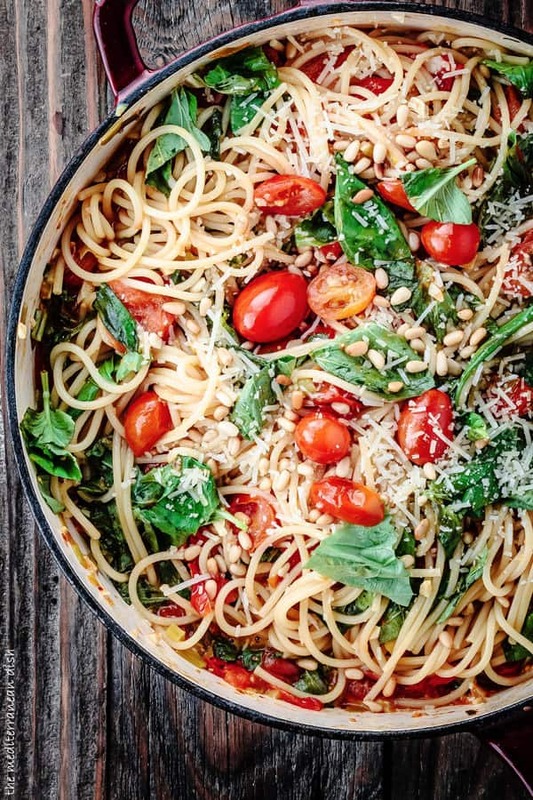 You’ve upped spaghetti a few notches, too! You have interchanged lemons and limes in the recipe…not sure which you used. Thank You! What an absolutely stunning dish Suzy! I love blackened chicken!